The Challenge- An international machine tool manufacturer utilizes a database program to track engineering modifications to its machine tools. 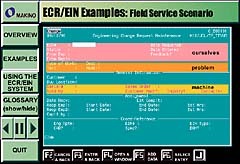 Service personnel around the globe are required to use this database to order parts and effect engineering changes to machinery. Use of the database is not intuitive so training is required for hundreds of personnel. The classroom training methods used were extremely costly. 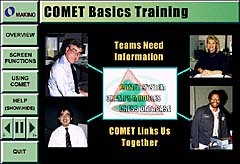 The Solution- DDM used an existing classroom training program as a starting point for a CD-ROM based computer based training (CBT) program. 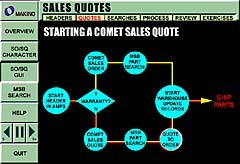 This program related the importance the database to the realization of the vision statement of the company. 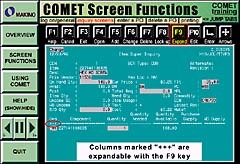 DDM simulated the database in the CBT. Exercises paced students through actual use of the database. The Results- The company was able to reduce costs by closing a rented classroom. Engineers were no longer pulled from their jobs to teach the classroom course. Local employees were able to take the CBT at training stations located in their workplace. Remote employees could take the course at their desk or while travelling. The return on investment was quite impressive. Also, training was deployed more uniformly and more universally.